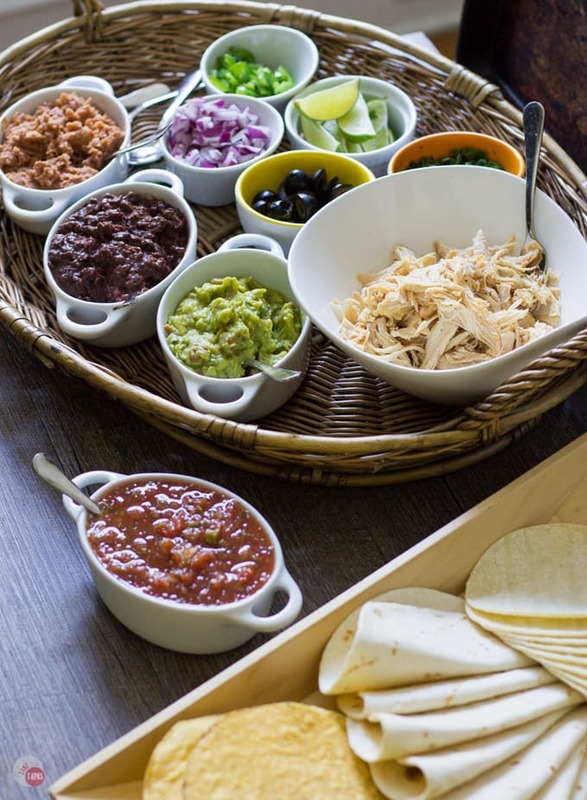 Put together this simple last minute taco bar, with the help of Good Foods, for when your spouse decides to invite a group over to watch the big game and you have less than 30 minutes! 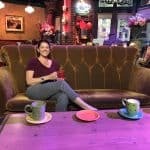 What do you do when the spouse walks in from their golf/tennis game and casually mentions that 10 people are showing up to watch the game in less than an hour? Aside from freaking out and banning golf and tennis games? A few weeks ago my hubby did this very thing. Luckily he caught me in a good mood and I had just been to the grocery store the day before, or I would have been a little stressed. In an attempt to keep from strangling him, I casually opened my fridge, took stock of my supplies. Then I ran all over the house picking up dirty socks, backpacks, stocking toilet paper, and emptying the dishwasher. After that initial 15 minutes of trying to make my house look presentable for guests, I assessed my food situation. When thinking of what to serve, I check out my food stashes to see what I can come up with. In the fridge, I have lots of guacamole, dips, and salsas. Being that I blog about tapas, appetizers, and party foods, I always have those essentials on hand. Really it’s because I snack and graze all day long, even for meals, so I usually ONLY have party foods. Appetizers and snacks can be healthy! Appetizers and snacks can be healthy! 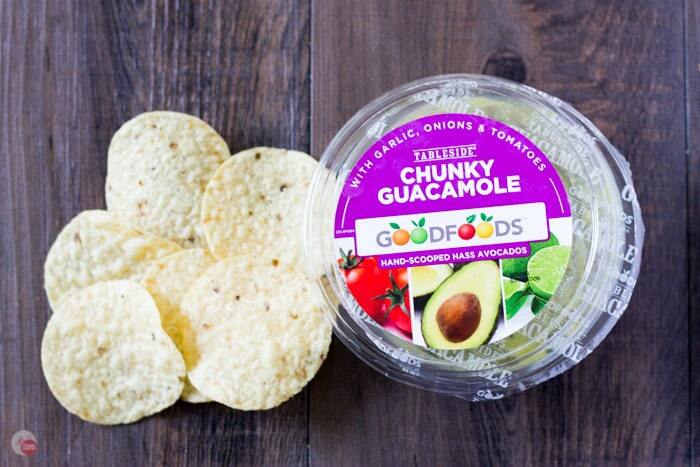 Good Foods has awesome guacamoles and dips that are all natural and never have artificial ingredients. That is a snack or meal, I can get behind! When you are eating lunch at your desk (or dining room table in my house) you need something healthy and keep you from getting the afternoon slumps so you don’t hit your head on the keyboard. Good Foods Tableside Guacamole is perfect for that! Along with some carrot sticks. After moving around the coconut milk around in the refrigerator, and my son’s half empty glass of apple juice that he will finish “later,” I find the rotisserie chicken I picked up from Publix, where I also grabbed my Good Foods guacamole, and the jalapenos while perusing the produce department in search of limes for cocktails. I’m already formulating a plan in my head when my oldest son comes running into the room, finally dragging himself out of bed, and proclaims he is starving to death and wants me to make chicken tacos. BOOM! Game Day Solved! You can’t say Game Day without Taco Bar. Well really you can, but do you want to? That is a Leslie Knope NOPE! In a frenzy with 6 minutes left until the guests show up, I pull out the jalapenos, half a red onion, some cilantro (that is still alive despite my black thumb), and some shredded cheese. Furiously chopping the toppings into small pieces so no one chokes and so they will fit on my tiny taco shells, I start opening cabinets. Yes, with my messy fingers. I’ll get that later!!! There are mouths to feed. I can wipe the cabinets down while everyone is yelling at the TV refs. In the cabinets, I find olives (that usually end up on my fingers before I eat them as any normal person would do), black and refried beans, and more chips! Perfect!!! I also have some tostada shells that I keep on hand to satisfy my late-night cheese toast cravings. I slap the taco vessels on a tray along with the toppings and add the chicken that I pulled off the bone and heated. 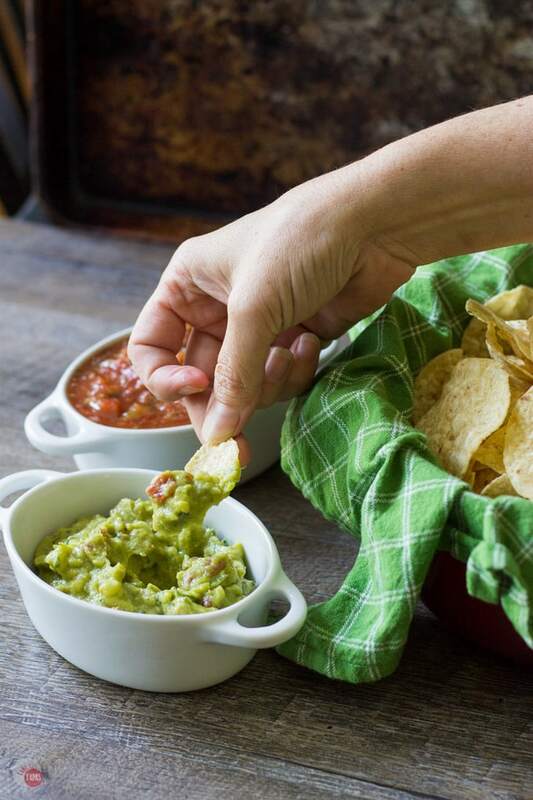 Throwing the dips and the guacamole in a few bowls and I have a taco bar! I even had enough chips and salsa to make a separate chip and dip set for the other end of the coffee table. Another easy entertaining way to serve Mexican food while watching the game is my Mexican Pizza Party Night! Everyone knows you can’t reach in front of someone who is watching the tv or you will get yelled at for blocking the most important play of the game. That would be grounds for taco bar removal. 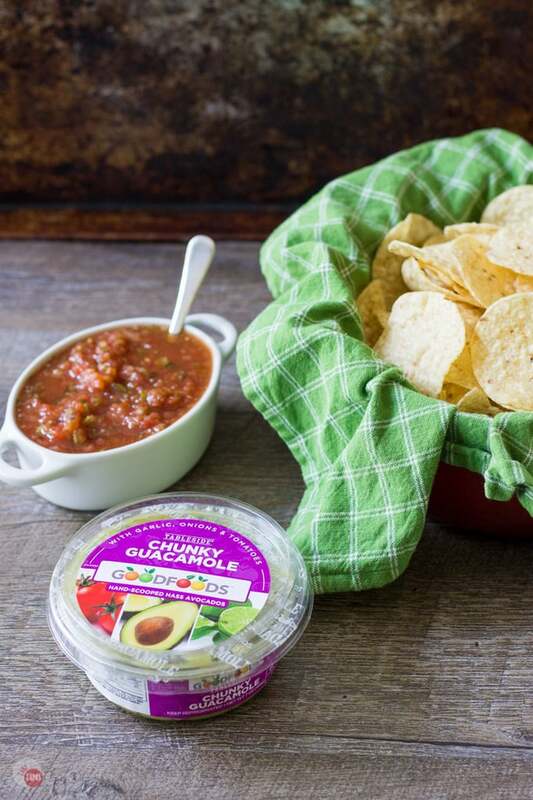 Spreading the food around for all to reach will help you #ShareTheGoodness without having to arm wrestle your friend for the perfect spot on the couch. Or control of the remote. I think I’ll sit in the dining room and watch from afar. My seat has a perfect line to the TV and a whole table to myself to eat the tacos that I assembled while putting the taco bar together. I just have to remember to wipe down the cabinets when I wipe down the living room. 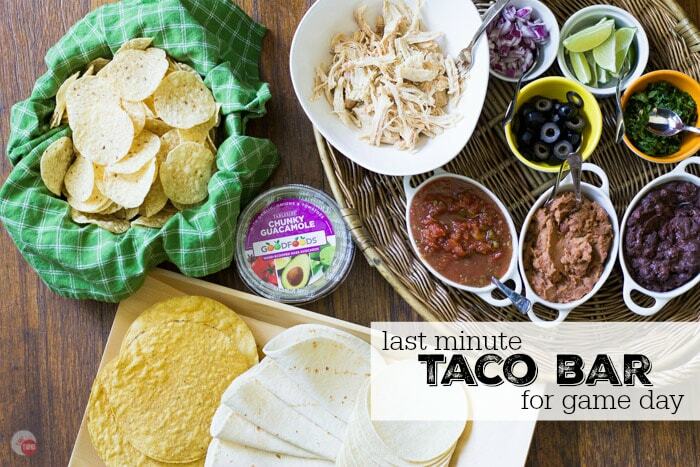 Having all the essentials for a last-minute taco bar will also keep you from getting suspended from game day entertaining. 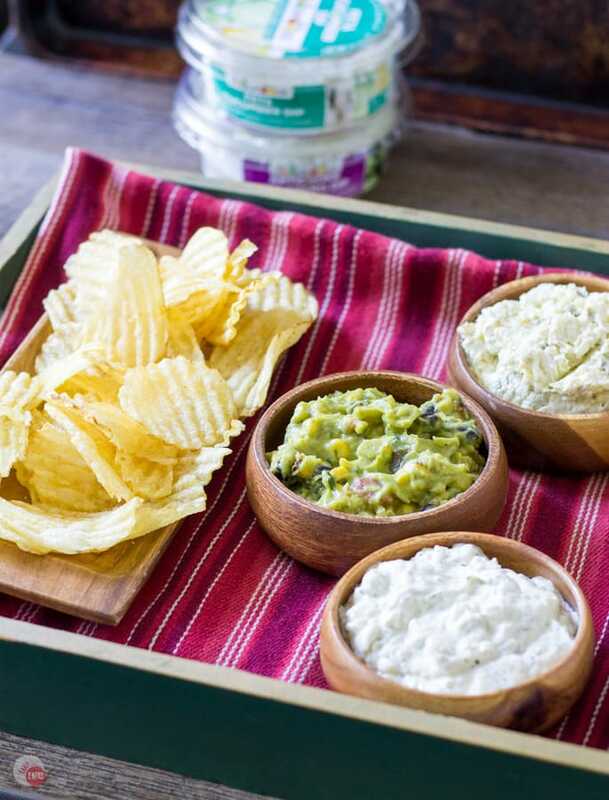 Happy Game Day Entertaining! Perfect for Saturday game days! Pinned! Well now I’m starving!! So much deliciousness J.
I love the idea of a taco bar! Will have to try this in our home the next time it’s game day! In France everyone watches soccer! 🙂 Thanks for this great idea! You can’t go wrong with a taco bar! Me too! I like it the way I want it! I will always be a fan of bars!